As I set out when explaining my Investment Policy Statement, I am a big believer in diversification. But I also know that you should only invest in what you know, and you can’t know everything; as Warren Buffet put it, “Wide diversification is only required when investors do not understand what they are doing.“. How to strike a balance between having enough skin in the game when I have conviction, and having enough diversification to allow me to sleep at night? 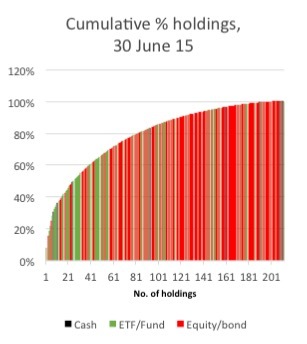 My own investment portfolio, which is a mixture of ETFs and direct holdings, and which covers a range of countries, contains more than 200 underlying holdings (see graph below). (Note: I say underlying holdings because I hold some securities in multiple accounts. I consolidate my overall picture every month into one spreadsheet which aggregates by underlying holding). When I started tracking my investments carefully a few years ago I had almost 250 underlying holdings – the result of gradual portfolio creep as I slowly accumulated odd lots in various things, and even when I became a seller I’d hold on to a rump holding just to ‘see whether I had made the right decision’. I must confess I didn’t study each new purchase with an equal amount of rigour. Some holdings are long-held, and where I have a solid understanding of the company and its developments. Others are more whimsical – based perhaps on a persuasive article, a chance stock screening exercise, or a spinout of a barely understood subsidiary. Three years ago I decided having 250 underlying holdings was getting ridiculous, so I have taken steps consciously to reduce the number of holdings steadily since then. I’m now down to about 210 holdings. Furthermore, about 40 of these are small lots that are part of two experimental portfolios I’ve been running; these are generally picked mechanistically rather than with in-depth knowledge. I think I could get down to 150 holdings, at least as easily as the committed two-packs-a-day man could cut down to just a dozen a day, easily, I’m certain of it. A special mention needs to be made of bonds. If there’s one asset class that clearly deserves diversification it’s fixed income – i.e. debt. While I think fund managers earn more of their fees managing bonds than managing equities, management fees of 1% feel steep. So while I do have some diversified bond funds, I also have some bonds I’ve bought myself. This hasn’t been a particularly fulfilling experience so I’m not planning to add to these holdings. Show some conviction, FIRE v London! One of the biggest arguments in favour of a smaller more concentrated portfolio is the relatively strong performance of my actively invested holdings. And as time goes on I have more ability to recognise when I have some unique ‘alpha’ (ability to beat the market). My problem? My smart bets have been pathetically small. I bought Next at £16 (now £70), Asos at £4 (now £35, down 50% from its peak), Workspace at £3 (now £9) – all of these investments had a clear investment thesis which came good in each case. But these investments were for much less than 1% of my portfolio, so even my tidy gains hardly register in my total return. Yet enough now I don’t usually have enough cash on hand to make a bold bet (because I ignore the wisdom of Buffett on cash), and even if I did I’m not an instinctive trader and I don’t have the confidence to back myself to put >1% of my portfolio to work on a new position. I’d welcome thoughts on whether I should man up, or just accept that I am a born passive investor. Moreover, I have seen for myself how few holdings are needed to provide genuine diversification. A few years ago I helped a junior family member start on an investing journey. Rather than investing in ETFs, we assembled a small portfolio of UK blue chip stocks, starting with three and adding another every three years or so out of reinvested dividends. I kept a careful eye on the performance of this mini-portfolio, and was interested to see that it tracked the overall stock market extremely closely – even though it only had 3-5 shares. One of the shares did really well; but another was BP, not long before the Deepwater Horizon disaster. Overall the effect of having one dullard and one bright star was to give us almost exactly FTSE-100 exposure. Many will argue of course that just 10-20 holdings is enough to diversify effectively – especially if those holdings are themselves diversified ETFs. The magic number? 3-15 holdings per asset type. As I work to streamline my portfolio further, what this boils down to is as follows: I want a diversified portfolio in each cell of my asset allocation matrix – i.e. in Australian Equities, in UK Fixed Income, etc. My matrix has (ignoring cash) eight cells in it. I think each cell should have 3-15 holdings in it, depending on size; this would result in maybe 85 holdings in total. For large positions, such as an ETF for the FTSE-100 (part of UK Equities, about 50% of my portfolio), I will hold it across at least two ETF providers, resulting in two holdings. For small exposures, such as Australian Fixed Income (target allocation: 1%), I am pretty comfortable with just two holdings total- ideally ETFs or funds. I have about 15 underlying Australian holdings (a couple of ETFs, one fund, the rest stocks), representing about 5% of my investment portfolio. I think I need, to include both ETFs and some actively held investments, maybe 20 holdings for my UK holdings (maybe 12-15 for Equities, 5-8 for Fixed Income). I certainly don’t need the almost 100 I actually have, but I find it curiously hard to sell any of them. Work continues. >200 is an awfully large number to keep track of – you must have some epic spreadsheets! I’m at just over 40 at the moment and am aiming to stay below 100! My spreadsheet is a mother. Very useful tho I can assure you! And I have it set up so i can just copy/paste from my monthly statements, adjust for any new/changed securities, and I am sorted. But you are right to stay below 100; I think I would if I was starting again. Over 200 companies is pretty epic! I currently have a little over 30 companies in my portfolio. I don’t expect to see my number of holdings going above 100 at all even after many years. I am happy with 30. As you say, it allows a certain amount of concentration to be able to benefit from gains but also enough diversification to protect from losses. I think your proposed “magic number” allocation looks pretty good though. It is also nicely attainable for you to get to!